24 MMS December 2016 mmsonline.com ONE-OFF Commentary "cutting edges." Because fresh media is con- tinually introduced into the stream, the stream's cu t ting e dg e s a re a lways s ha r p, minimizing the chance for delamination or leaving behind burred edges. 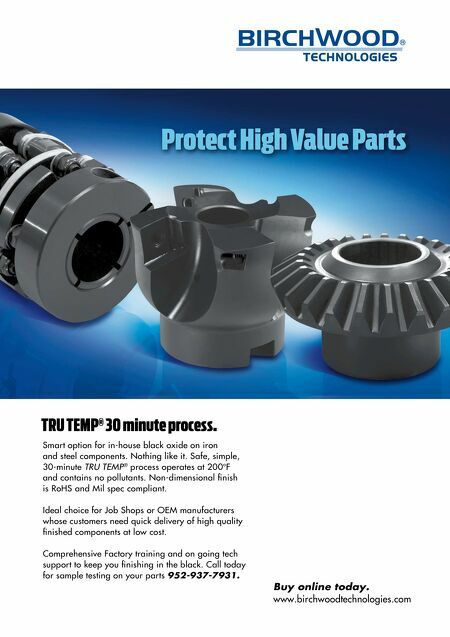 When milling is the only viable process, the shop uses balanced, HSK shrink-fit toolholders to min- imize tool runout and prevent cutters (primarily diamond-coated tools) from wearing non-uniformly. Because most of its composite workpieces are relatively thin, it will also routinely alter the depth that a tool reaches through a workpiece to get the most out of a tool's total available flute length. • Wood—One of my favorite shops I've visited was Thorn Custom Guitar (you might not find that surprising given my Motorhead reference earlier). 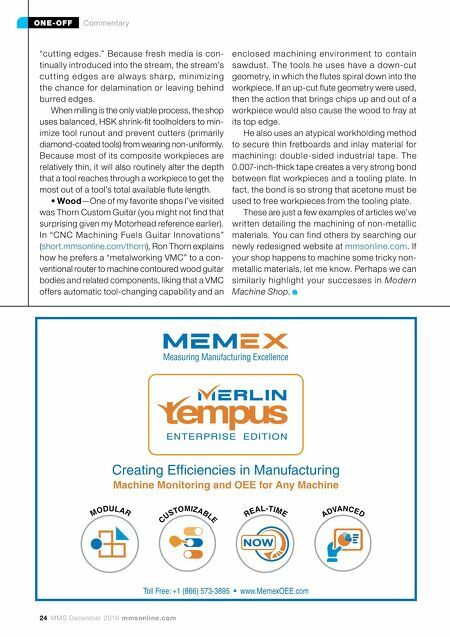 In "CNC Machining Fuels Guitar Innovations" ( short.mmsonline.com/thorn ), Ron Thorn explains how he prefers a "metalworking VMC" to a con- ventional router to machine contoured wood guitar bodies and related components, liking that a VMC offers automatic tool-changing capability and an enclosed machining environment to contain sawdust. The tools he uses have a down-cut geometry, in which the flutes spiral down into the workpiece. If an up-cut flute geometry were used, then the action that brings chips up and out of a workpiece would also cause the wood to fray at its top edge. He also uses an atypical workholding method to secure thin fretboards and inlay material for machining: double-sided industrial tape. The 0.007-inch-thick tape creates a very strong bond between flat workpieces and a tooling plate. In fact, the bond is so strong that acetone must be used to free workpieces from the tooling plate. These are just a few examples of articles we've written detailing the machining of non-metallic materials. You can find others by searching our newly redesigned website at mmsonline.com . If your shop happens to machine some tricky non- metallic materials, let me know. Perhaps we can similarly highlight your successes in Modern Machine Shop.